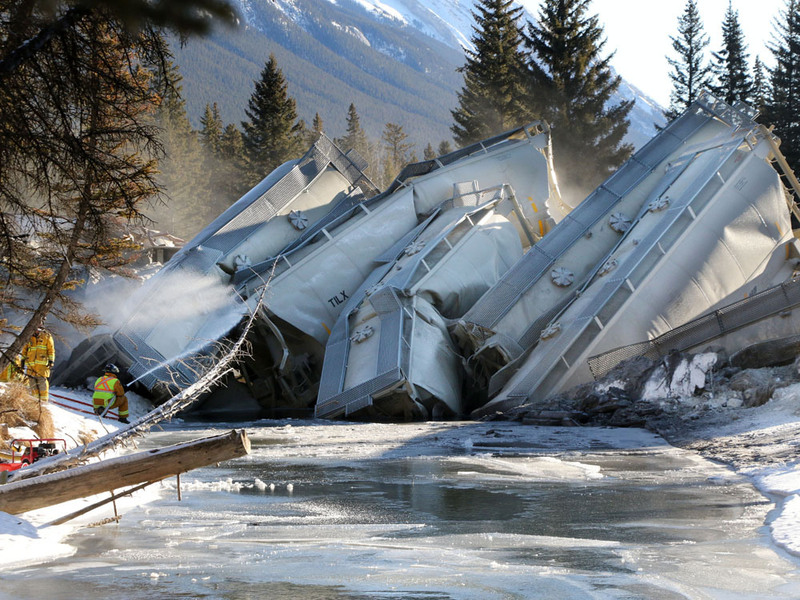 A major derailment of a Canadian Pacific Railway train occurred early this morning in Banff National Park, Alberta (Calgary Herald). 15 cars loaded with fly ash and lentils fell off CP’s main track on a bridge crossing over 40 Mile Creek near the Banff townsite. 7 cars crashed into the creek, spilling some of their contents into the water which turned the water a murky colour. The derailment occurred only about 200 metres upstream of the Bow River, and there is concern that the spilled fly ash will enter this major river which flows through Calgary. Alberta Environment staff said the impact that the spill will have on fish in the creek will depend on the amount of ash that was spilled, which has not yet been determined. The spilled ash will lower the acidity levels in the creek which would negatively affect fish and other aquatic life. Spilled grain is likely to attract local wildlife including elk, moose and deer. Any grain that has not been cleaned up before spring will also attract bears when they come out of hibernation. Crews plan on installing a temporary dam on 40 Mile Creek in an attempt to decrease the amount of ash and grain that will flow into the Bow River. CP said 22 to 27 trains travel on their main line through this area every day, sometimes carrying petroleum products and other dangerous materials. Work is under way to clean up the mess of rail cars and spilled materials, but it is not known how long this will take. The major derailment in one of Canada’s best-known and popular national parks has reignited concerns about rail safety and the speeds at which trains travel through sensitive habitats. ~ by railroaded on December 26, 2014.